New Concert Tour: Dreams Come True Wonderland 2015! 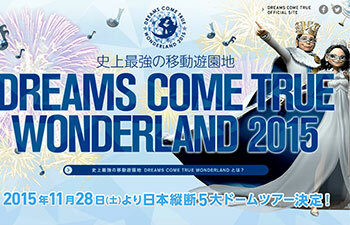 Dreams Come True’s Wonderland 2015 concert series has been announced and the tour dates are now available! All shows have been sold out and the 30 fan selected songs have been picked. There’s also a traveling Wonderland museum at each of the main site venues. A number of DCTJoy.com forum members will be attending the concert series, so you’ll be able to find reviews of the shows soon! There were be 17 total shows (9 in baseball stadiums/8 in smaller venues).